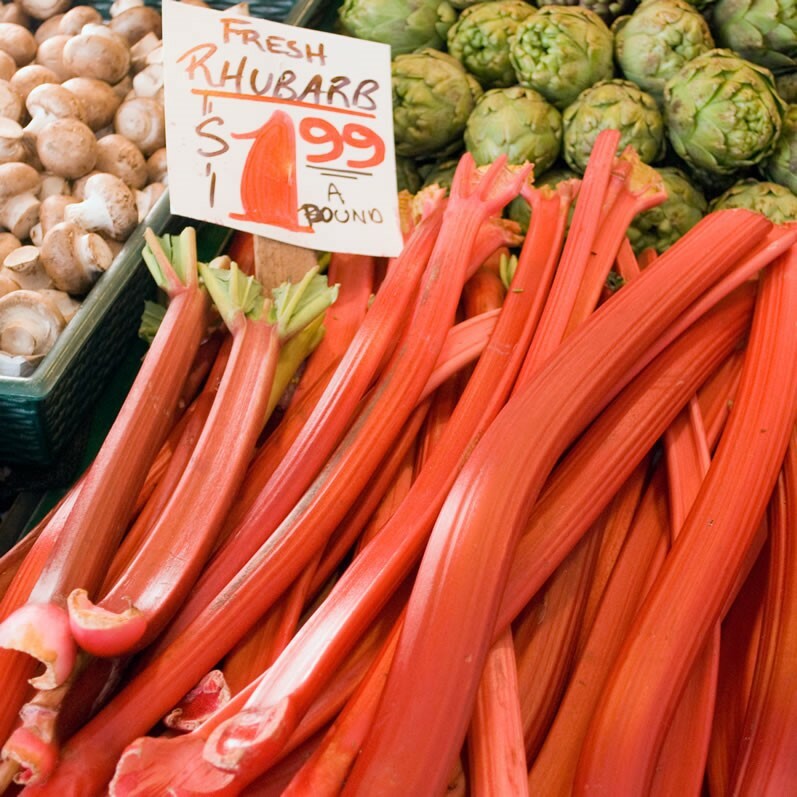 · Rhubarb is one of the least calorie vegetables and contains no saturated fats or cholesterol. · The stalks are rich in several B-complex vitamins (folates, riboflavin, niacin, vitamin B-pyridoxine, thiamin, and pantothenic acid. · The stalks also contain poly-phenolic flavonoid compounds like β-carotene, zea xanthin, and lutein which convert into vitamin A and deliver same protective effects of vitamin A. Vitamin A is a powerful natural anti-oxidant which is required by the body for maintaining integrity of skin and mucus membranes. It is also an essential vitamin for healthy eye-sight. Research studies suggest that natural foods rich in vitamin A help the body protects against lung and oral cavity cancers. 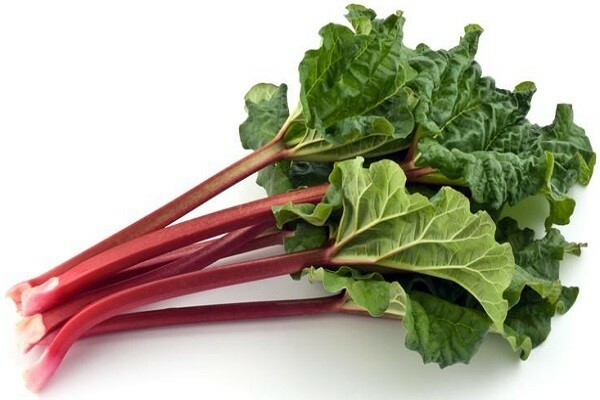 · Rhubarb is loaded with vitamin K, which has a potential role in bone health (promoting bone formation and strengthening). Adequate vitamin-K levels in the diet limit neuronal damage in the brain (staving off Alzheimer's). · Its stalks also contain healthy levels of iron, copper, calcium, potassium, and phosphorus. You'll find it in the store April until August. You'll notice you'll rarely find it in the produce department with its leaves attached (the way you do fresh beets). This is because the leaves contain oxalic acid as well as poisonous glycosides. In addition, greens drain away nutrients from the stalk. Look for fresh, firm, crispy bright-red color stalks. Avoid any dull, slumpy, bruised, or blemished stalks. Once at home, stalks should be placed in a plastic bag and stored in the refrigerator. They like humidity and will keep for about 2-3 weeks. Fresh rhubarb features with a rich sweet-tart flavor (more tart than sweet, really), and in general, younger and smaller stalks have less or no strings and have sweeter flavor. So whether you're growing it or just shopping for it, the smaller the stalks, the better. To prepare rhubarb, you'll trim the ends with a very sharp paring knife. Wash them in cold running water, gently scrubbing the surface using fingers. Cut the stalks into 1/2-inch to 1-inch pieces. Their extreme tartness is tamed by the addition of sugar, honey, syrups, and so on. 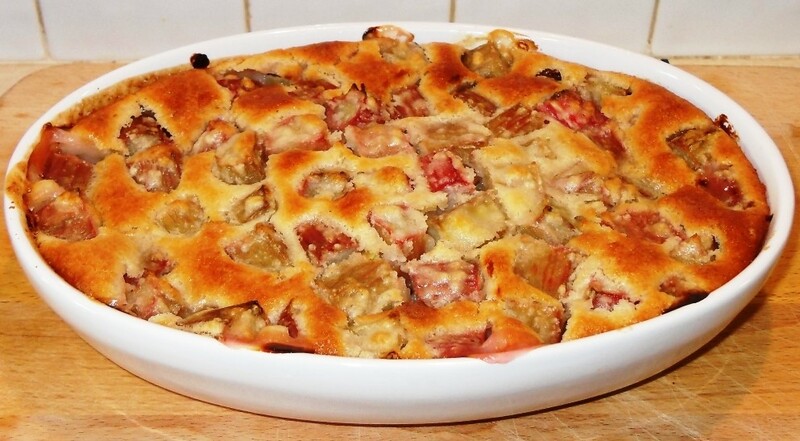 Most of us know rhubarb because of its addition to strawberry pie. But there are other equally delicious ways to use it. Its crispy, juicy stalks can be used in the preparations of sauces, preserve, jellies, jams, syrups, sorbet, and juice. I add a stalk to my green smoothies when it's in season. 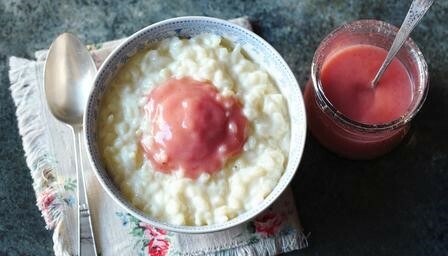 It's terrific when pureed and added to rice and tapioca puddings. 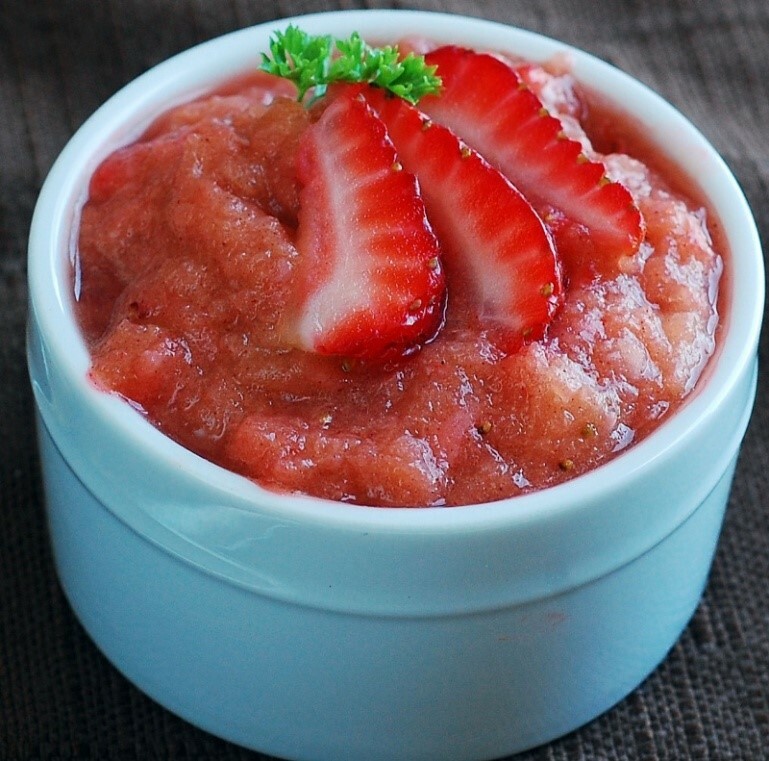 It adds a super flavor zing to traditional applesauce. 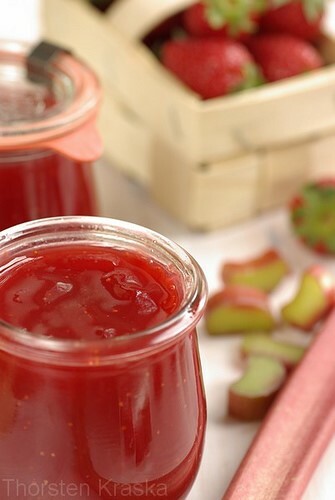 When it's finely diced, it pairs very well with sliced apples as a filling for a crisp, cobbler, or strudel. 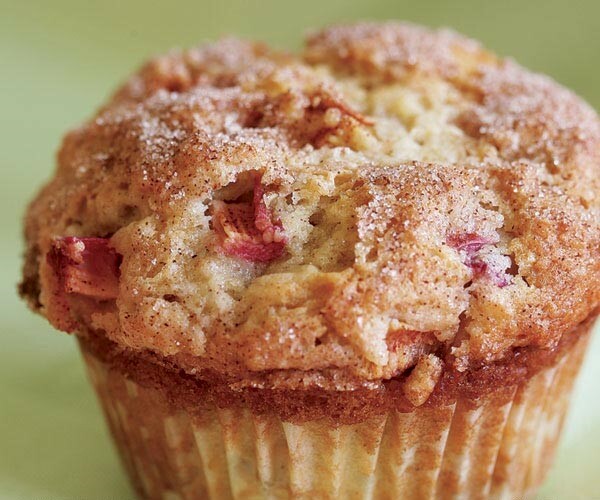 And it's wonderful when pureed as an addition to pancake and waffle batter, or finely chopped and mixed with cinnamon when making muffins (one of our favorite ways to use chopped rhubarb). Position a rack in the center of the oven and heat the oven to 400°F. Line a 12-cup muffin tin with paper or foil baking cups. Make the muffin batter: In a large mixing bowl, combine the flour, sugar, baking powder, cinnamon, baking soda, and salt and whisk to blend. In a medium bowl, whisk together the sour cream, melted butter, eggs, and vanilla until smooth. Lightly stir the sour cream mixture into the dry ingredients with a spatula until the batter just comes together; do not over-mix. Gently stir in the diced rhubarb. The batter will be thick. Make the topping: In a small bowl, combine the sugar and cinnamon and mix well. Sprinkle a generous 1/2 tsp. of the cinnamon-sugar mixture over each muffin. Bake the muffins until they're golden brown, spring back most of the way when gently pressed, and a pick inserted in the center comes out clean, 18 to 22 minutes. Transfer to a rack and let the muffins cool in the pan for 5 to 10 minutes. Carefully lift the muffins out of the pan-if necessary, loosen them with the tip of a paring knife-and let them cool somewhat. Serve warm. Make Ahead Tips: The muffins will keep for one day; just reheat them in a 350°F oven for 3 to 4 minutes to refresh them.